The World Federation for Medical Education (WFME) co-sponsored a project which reached consensus on how medical schools can become more socially accountable. The other sponsors were the World Health Organization (WHO), THEnet: Training for Health Equity Network and Société internationale francophone d’éducation médicale (SIFEM). More than 130 organisations and individuals from around the world with responsibility for health education, professional regulation and policy -making contributed to a three-round Delphi process leading to a three-day facilitated conference and the development of a consensus statement. The Flexner Report (1910) described the challenges to medical schools at the start of the 20th century in becoming more scientific and more effective in the training of physicians. The 21st century presents new challenges: improving quality, equity, relevance and effectiveness in healthcare delivery; reducing the mismatch with societal priorities; redefining roles of health professionals; and providing evidence of the impact on health. 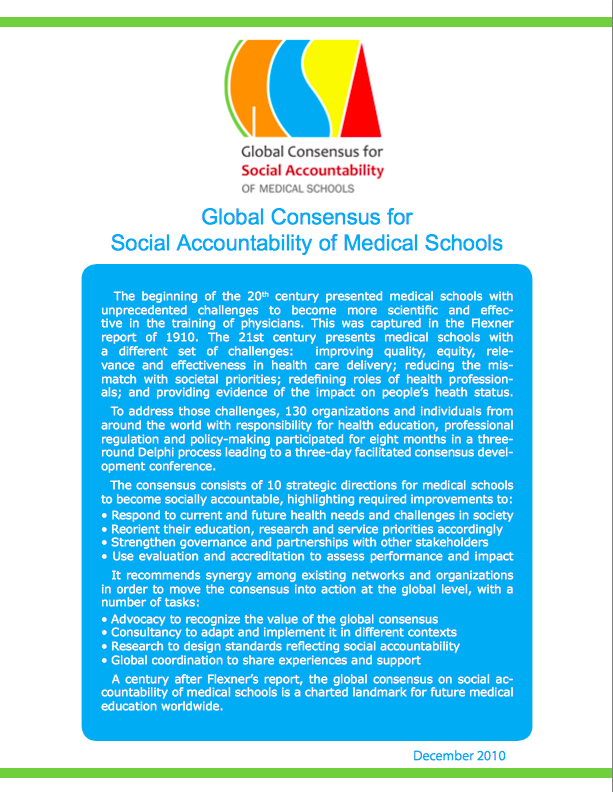 A century after Flexner’s report, the global consensus on social accountability of medical schools is a charted landmark for future medical education worldwide. use evaluation and accreditation to assess performance and impact. The consensus statement recommends synergy among existing networks and organisations to move the consensus into action at global level, with a number of tasks including advocacy, adapting the consensus into different contexts, research into the standards for social accountability, and global coordination to share experiences and support.